A blast of citrus (particularly grapefruit) on the nose is quickly followed by sweet notes of cotton candy. There is a menagerie of fruit on the palate, complex, and layered. Cleverly bitter. 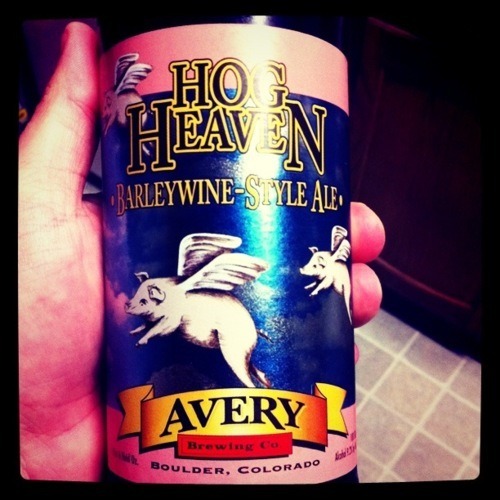 So I am new to this whole barleywine style… but this Hog Heaven has been compared to a double IPA. I LOVE IPA, so it makes sense that I would love a double IPA. The beer smells like an IPA, but with an immediate smack of bitterness. I do like bitter. The beer starts pretty smooth as it moves it’s way across your palate. Then you are just tackled with extreme layers of bitterness. Then, about thirty seconds later, as the aftertaste starts to fade, you get some sublet sweetness. I wouldn’t call it chocolate… maybe a dark cocoa. Love the mouthfeel though, as there is practically no carbonation. There are certain beers that I like carbonated; an IPA isn’t one of them. The bottle is cute, I really like the label. It has, you guessed it… a hog on the front. The label is also pink (my favorite color), which is fitting considering the name. I feel like I have had this beer before, but maybe not. Not sure… regardless, this is a great beer and has a ton of IPA characteristics about it. It has a pretty big ABV as well, so if you want to drink these maybe only order a couple of bottles. The beer doesn’t smell nor taste like alcohol. Good beer… thanks to the swine! Bottoms up people! The beer we are drinking tonight is another barleywine. We had one of these a while back, and I thought it was really good. I think this one promises to be pretty great as well, at least judging by the smell. When I opened the bottle I caught a whiff of it… it smells amazing! It’s kind of an orangey color, and very thick in the glass, with a head that is taking a while to dissipate. It still smells great, though, even after sitting a few minutes. Actually, I kind of don’t like how even after sitting here for a while, the head has still not gone away. I prefer drinking my beer headless. Oh well, let’s try it anyway. It tastes really good, much like an IPA, as Ricky said it probably would. This one doesn’t taste as fruity as the last barleywine we had. I kind of liked the other one better, but this one is good in its own way. It definitely is much more hoppy and has a very strong IPA taste to it. It’s great, just not quite what I was hoping for tonight. Very spicy and hoppy, great beer. This might be close to the top of my list if I was in an IPA mood and looking for something to drink.